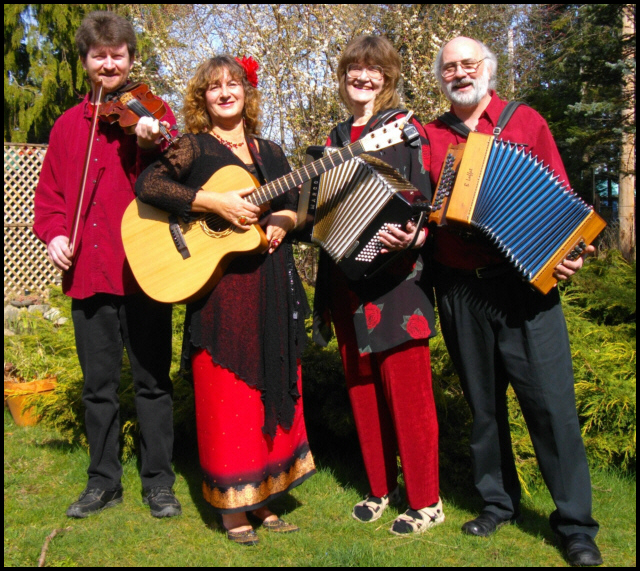 Dreamyth is a quartet from Gabriola Island who perform an eclectic mix of American, European, Roma, Sephardic, Gypsy and Celtic folk as well as original songs and tunes. Their blend of the old and the new, the slow and the lively, will entertain you, delight your ears and feed your soul. Each member of Dreamyth brings their unique talents to the mix. Whether its with an exciting fiddle tune, a soulful French waltz, a sweet ballad about unicorns, or a mournful Sephardic love song, this accomplished and home grown Gabriolan quartet will please your senses and arouse your imagination. So be prepared to be lifted into the air of whimsy, sung into legend and mystery, and swept into dreams and myth. La Rosa Enflouresce - Song from the Jewish Saphardic tradition. The Flirtation - A song by Andrea Georgiev in the Tango tradition.